Looking around the town of Escalante we see old pioneer homes. Other homes have watchdogs and barbed wire with all sorts of junk in the front yard. 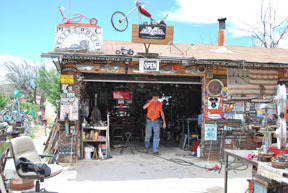 Driving past the Desert Doctor’s abode we find a motorcycle hospital far removed from any medical plan imaginable. The Good Doctor’s operating room is just off Main Street. It’s impossible to miss with its hand-painted tires listing countries of the world from where his customers originate. His shop is packed floor to ceiling with parts and tools, all well organized. The Doctor, who prefers anonymity, is a metal sculptor and bike mechanic who is steeped in biker culture where freedom and the open road rule. Something tells me if everything in our world wound up being the Mad Max movie, this guy would be just fine. So how did he end up in Escalante? “I broke down here 25 years ago and I’d never found a more unfriendly place. Tattoos, leather and a ponytail shouldn’t make a person an outcast. But for the Doctor, the locals weren’t quite ready to accept his slightly less than farm friendly attire. 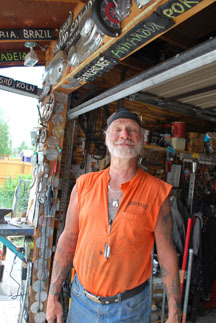 He spent a month hitchhiking back and forth from Vegas to get the right part for his motorcycle. Slowly the town of Escalante is becoming much more friendly to outsiders since it now has a burgeoning tourist industry. Besides the Doctor, there are four other residents in the town also from Chicago. The excellent Circle D Restaurant and Hotel are operated by a Chicagoan. Serving on the Escalante Chamber of Commerce and The Highway 12 Preservation Committee, the Doctor and other Easterners are beginning to have an impact on this small town. It’s still amazing that big city folk could enjoy a place full of cows and vistas but not much else. My question for the Doctor was: So what do you like about this place? “I like the weather, the heat. I like the mountains. I like the red dirt. A lot of people said life ends when you leave Chicago. For us life has just begun. Route 12 is one of the most magnificent places to go.” The Doctor had his opinion comparing Route 66 to Highway 12.